Nepal remote are trekking offers trekkers an opportunity to explore the country’s long preserved secrets of snow-covered glaciers, concealed and medieval villages, impressive lakes, Buddhist Monasteries, varieties of flora and fauna and cultural diversities. Lying in the rain shadow area of the Himalayas, the landscapes have a similarity to that of the Tibetan Plateau with enthralling splendor and distinctive culture, a great place to witness the full spectrum of wildflowers. From Jumla, one may recognize ground orchids, corydalis, impatiens, roses and higher up in the alpine areas larkspurs, geraniums, poppies and saxifrages proliferate. Shey Phoksundo National Park with the diversity of plant and animal species is another attraction. 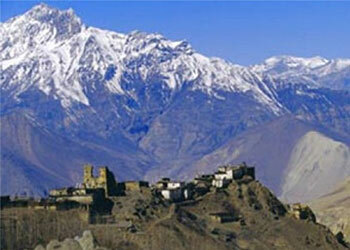 Look for the flocks of swift-flying snow pigeons and gliding pairs of Himalayan griffons. Within the forest along the trek to Rara Lake, it is entirely possible to catch sight of Nepal’s national bird, the Impeyan Pleasant (locally Danphe). Excellent places to spot blue sheep include the danger Kangmara trail. Moreover, one is likely to experience the vast array of wildlife inhabiting the region, including Blue Sheep, Mountain Goat, Jackal, Wolf and the legendary Snow Leopard. The landscapes of remote trekking are huge, broken only by the massive snow-capped peaks some of the country’s best trekking secrets including spectacular turquoise lakes, Tibetan monasteries, and breathtaking high passes. 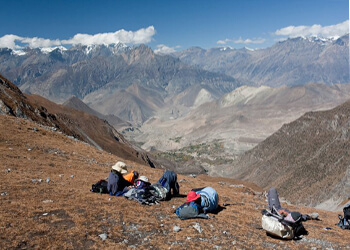 Approach from the south ascends the Hindu lowlands through deep gorges or over high passes into the remote arid landscapes of Do Tarap and outer Dolpo. The route goes through the ancient Tibetan salt caravan route and high passes like Numa La (5190m), Baga La (5070m) and Kagmara –La (4800m) and other very remote areas of the country. Trek to Kanchenjunga clocks in as the world’s third-highest peak at 8586m. Further west, mighty Makalu (8463m) comes at number five. The foothills of these Himalayan giants passes through the remote country that provides a flashback to what the most country have like when explorers such as Edmund Hillary made the first ascents in the 1950s. Trekking trails in Easter in Nepal follow a series of melt Water Rivers and streams, passing through a fascinating variety of landscapes – terraced rice fields, dense rhododendron forests, rolling alpine meadows and the desolate lunar landscape of the high Himalaya. The most admired areas for trekkers in the eastern region are the Makalu Barun National park on the border of Tibet and the Kanchenjunga massif on the border to Sikkim. This wonderful Eastern region trekking of Nepal can be started with a breathtaking scenic flight This remote area trekking is comparatively frequented and thus the unspoiled villages and environment are yours to discover without the distractions of other trekkers. The expedition can get fairly strenuous at times while crossing the passes, but for every hard sweat, you will be pleased with dazzling sceneries as it advanced towards the windswept rugged terrains with overwhelming views of the towering peaks.